An Israeli man was stabbed to death in a terror attack next to the Gush Etzion Junction in the central West Bank, south of Jerusalem, on Sunday, succumbing to his injuries shortly after arriving at the hospital, officials said. After he was stabbed, the victim chased and shot at his attacker, before collapsing to the ground. 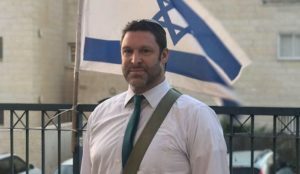 He was later named as Ari Fuld, 45, from nearby Efrat. “A terrorist arrived at the shopping mall at the Gush Etzion Junction armed with a knife. He stabbed a civilian, injuring him seriously. Another civilian who was at the mall neutralized the terrorist,” the army said. Fuld was taken in serious, unstable condition to Jerusalem’s Shaare Zedek Medical Center, where doctors pronounced him dead…. Security camera footage from the scene showed the teenager, dressed in black, standing behind Fuld for nearly a full minute before attacking. After the stabbing, the terrorist ran from the scene but was shot by Fuld and the armed civilian….